Thirty-three HIBT teams and captains brought in their gear and headed for Kailua Pier. Fishing is getting hotter and tag and release points keep adding up. Thirty minutes before the official end of Day Four, China Sea Wolf Club, fishing aboard 39-foot High Flyer, hooked up just north of Kailua in an area called Juliet. 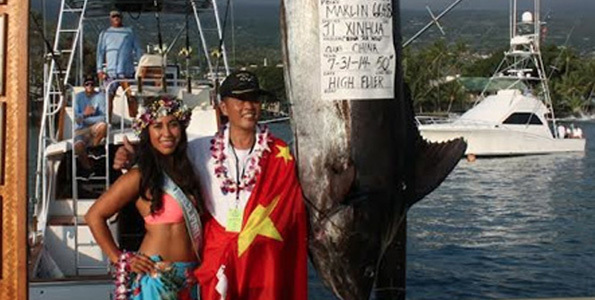 Angler Ji Xinhua fought a hard fight and was well rewarded as he boated a 664.8-pound Pacific blue marlin. As the fish was brought out of the boat to be weighed at the Kailua pier, cheers and shouts of excitement rang out from nearby spectators. China Sea Wolf Club is now planted firmly in first place leading into Friday’s final day of fishing. Right behind them, Team Friends of Kenya, fishing aboard 47-foot Nasty Habits weighed in a 394-pound Pacific blue marlin. Team captain and angler Mark Allen caught this marlin using 50-lb test line. Teammate Mark Smith tagged and released an estimated 275-pound Pacific blue marlin earlier in the afternoon. The morning was quiet in comparison but certainly deserves a look at. First tag and release was called in just after 9am by Old South Marlin Club–Pacific Rim. Fishing aboard the 41-foot Kona Seafari, veteran angler Steve Gunther tagged an estimated 140-pound Pacific blue marlin in 32 minutes, adding points to the scoreboard. Australia’s Queensland Game Fishing Association, fishing aboard the 41-foot Bite Me 6, hooked-up in an area called Lima. Angler Doug Sauderson was able to tag and release an estimated 135-pound Pacific blue marlin in 40 minutes, putting more points on the board for this spirited team. Olympian Dream Fishing Club continued its fishing streak when team captain and angler Yasuhiko Kagabu hooked up, fishing aboard the 46-foot Foxy Lady. Kagabu tagged and released a Short nose spearfish in three minutes continuing to put points on the board. Not to be outdone, teammate Mari Arakawa boated and weighed-in a 123 pound ahi. In 2012, this experienced woman angler won the HIBT Dudley C. Lewis Award for the highest individual women scorer.